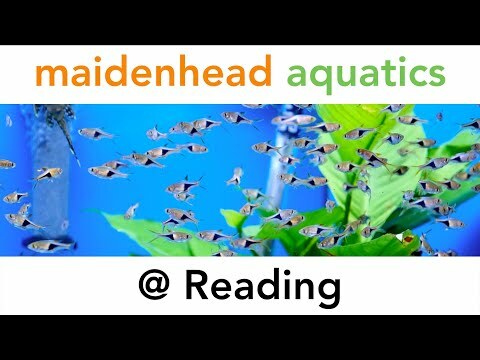 Welcome to one of the largest Maidenhead Aquatics in the area. We are a 4,000 sq ft superstore based in the lower sales area of the Henry Street Garden Centre at Arborfield, and we stock everything you could want for your pond or aquarium. This store is perfect for the avid pond keeper. On entering the store you will see our 15,500 litre koi pond that features two six-foot windows, allowing you and the children to observe and enjoy the selection of larger Japanese koi. Further enjoyment can be had by feeding the fish - just ask at the counter for some food (charge applies) and watch the koi rise and take the food from your hand! Two further systems hold the rest of the coldwater fish for sale, the pond system is a mixture of aquariums and vats that houses indoor fancy goldfish and general pond fish such as goldfish, shubunkins and golden orfe. We have a new separate system specifically for koi. As with most stores, our fish stocks will be higher during the summer months and will usually include blue orfe, tench and ghost carp. Pond filters are stocked to suit ponds from 2,000 litres to 30,000 litres along with a large range of pumps to suit all needs. Our staff are always on hand to help you with your selection, so there's no need to worry! In our outdoor area you can find further pond accessories from plastic pools to fibreglass ponds, waterfalls, soil, gravel, pvc and rubber liners to a wide selection of pond plants. We have everything needed to make a healthy pond. Back inside the shop is the tropical section. We have three systems for freshwater fish and two for marine. We always aim to stock a wide range of fish to appeal to everyone, but with fish arriving most weeks, the selection is always changing. For this reason if there is a certain species that you are looking for, please give us a ring first and if we don't have it at the time, we will gladly try to source it for you. Aquarium plants are in abundance with one six-foot stock tank holding quality Dutch plants, bunched plants and specimen pieces of planted bogwood. Regular weekly deliveries means that we always have a good variety in stock, but again, if there is a certain species you are looking for then please call. Dry goods are plentiful with a mixture of full-size and low-level shelves. From airstones to external filters, we have it all. Aquariums and cabinets are well displayed with a range of manufacturers stocked. With sizes from 15 litre to 350 litre we have something to suit the beginner or the experienced fish keeper. To the rear of the store we have a further pond but this time a tropical one! 7,000 litres is the home for a collection of real "tank busters". Maidenhead Aquatics has long held a "big fish policy" that avoids selling fish from any species that grow too large for home aquarists to adequately house and maintain. However we always try to accept and "re-home" fish that have outgrown their owners' capabilities. While some stores only have 6-foot sumps and cannot house some species over the long term, this pond was created specifically to offer a home to these fish. Our collection includes several catfish species including two red tail catfish, and a shoal of pacu. Marines are to be found in the middle of the store with a wide range of inverts and fish always in stock. As well as our fish only system, we have a separate system for inverts and soft corals and a dedicated six-foot tank just for hard corals (though our hard coral system is not yet up and running). We get our stock only from trusted suppliers, so you can be assured of high quality. Again, we have often have new stock coming in most weeks, if there is a certain species that you've been looking for then we will gladly order it for you.